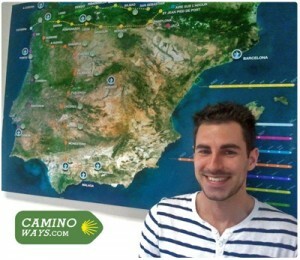 This week, we have welcomed our new intern, Jerome Bellanger, to the CaminoWays.com team. Jerome is from La Rochelle in the French West coast and will stay in Dublin for six months. After finishing his degree in Marketing, Jerome was travelling for a while before landing in Ireland. He speaks French, Spanish and English and will be working with our Marketing team. He likes running, football and is looking for a good place to play badminton in Dublin…any suggestions?